Huawei today invited us to an exclusive press conference that will take place on November 3 in Munich, Germany. On that day, the company will officially unveil "a new flagship device." 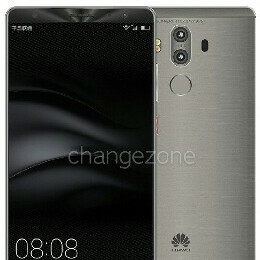 Huawei didn't provide specific details about its upcoming device, but it's very likely that this is the rumored Mate 9. We liked the Mate 8 for its design and battery life, but we weren't impressed with its display, user interface, and cameras. Let's hope the Mate 9 will bring improvements on all fronts. Until we hear more about this, you can check out a series of alleged Huawei Mate 9 renders in the slideshow below (right now, we can't be sure that this is what the real device will look like). Mate 9...? Mate Nine...? Why, it brings wrong kind of thoughts in my rotten brain... Oh well... Perhaps I'm a bit too OLD SKOOL, eh? G'Day! Huawei put a lot more into advertising than they do into their phones. Ugly? If THAT'S ugly then I've no idea what BEAUTY is...! Beauty lies in the eyes of the beholder... And... Better hear this out, toy might mean something... Ugliness lies in the heart of the beholder... Think about it... G'Day! "toy might mean something." Sigh... Darn keyboard, totally ruined the 'moment'... I meant to say; "You might learn something..."
i just hope that the 6gb version comes to europe not like the mate 8 and china gets the 4gb version and we dont. i would have this Beauty than a iphone or a Samsung note 7 grenade. My next phone. I will import if necessary. The Kirin 960 is Artemis arm Cortex A73 architechture. The people who say that is Cortex A72 are totally wrong. Please search in the net and confirm. It's A73. Oh, it will. IPhonearena will not let any phone score higher than their mighty iPhone 7 and 7 plus.